BPM-X® translation software supports all major tools to leverage business process models for a process-driven testing. 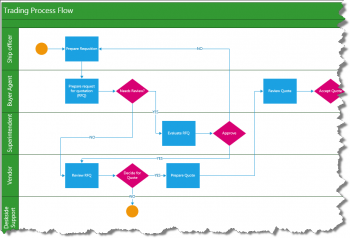 Below we see a Visio® example of a cross-functional flowchart showing a common purchase/requisition process which can be executed with standard ERP software from vendors such as SAP®, Oracle® or Microsoft®. All organizations have their specific conventions regarding roles, the sign-off of process flows or the handling of documents. The challenge project teams are facing when implementing customized ERP applications is evaluating possible process flows and then testing them. With BPM-X® tools we help teams to leverage existing process models and automatically generate the required test cases with test scripts in whatever format, for instance Microsoft® Excel®. 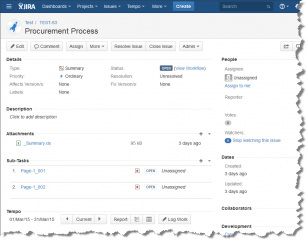 At this stage JIRA® comes into the game. JIRA® is a web-based issue management system manufactured by Atlassian®. This system has built-in workflows which can be adjusted for the needs of testing with different roles like test manager, engineers, testers and developers. BPM-X® handles process models in a large variety of specific data formats.For a long time Visio® used to stored diagrams in XML; from Visio® 2002 up to Visio® 2010 this exchange format was called VDX. Although each version had its own “flavor” all was more or less workable until this changed for Visio® 2013 when Microsoft® introduced the new and quite complex VSDX format called Office Open XML scheme that is used by all Microsoft® Office products like Word®, PowerPoint® or Excel®. The BPM-X® translator tool has the capability to directly read and write the VSDX data format. This allows for the efficient processing of models captured with Visio® to generate test cases, for instance in Excel®. Test cases can then directly be uploaded to JIRA® via the standard JIRA® REST web services API. For each process model a summary issue is created in JIRA®, per test case a sub-issue is created and the test script is uploaded as an Excel® sheet.